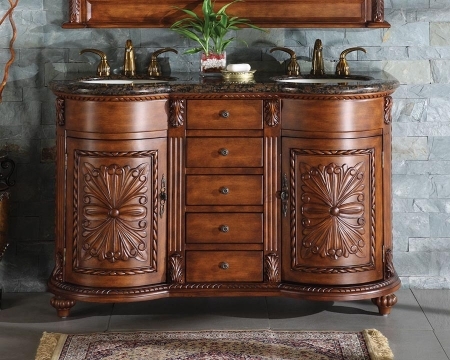 Wonderful flower like designs carved onto the cabinet door fronts make this double sink vanity a very elegant addition to the room. The details are enhanced by the rich brown finish that allows the natural beauty of the wood to join the design. 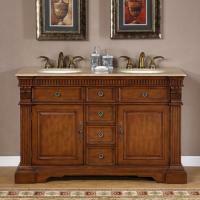 Each of the cabinets as well as the five drawers in the center of the piece provides ample room for storage in the space. 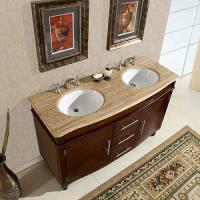 The counter top is created with a Baltic brown granite material and surrounds each of the white ceramic integrated sinks. The elegance of this piece is sure to make an amazing impact within the décor of the room and it will be appreciated for many years to come. 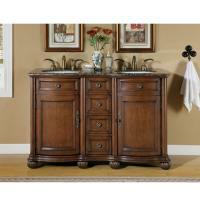 Material: This bath vanity is constructed of a combination of select solid hardwoods with granite boulder. 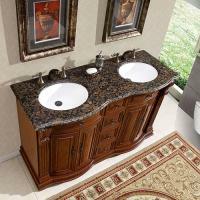 Granite is a hard non-porous surface, which makes it an ideal material for sinks and countertops. Granite resists heat, scratches and stains, and protects against mold and mildew. It’s recommended that you seal granite every 6 - 12 months. All hardwoods have been Kiln dried to ensure a stable product that will not expand, contract, or warp. Counter Top: Granite is a hard non-porous surface, which makes it an ideal material for countertops. Granite resists heat, scratches and stains, and protects against mold and mildew. It’s recommended that you seal granite every 6 - 12 months.